STAR TREK: Looking back at THE EUGENICS WARS | Warped Factor - Words in the Key of Geek. Matthew Kresal revisits The Eugenics Wars to learn of the creation and life of Khan Noonien Singh. The release of Star Trek Into Darkness almost two years ago now helped to once again spur interest into one of Trek’s greatest villains: Khan. We’ve been told Khan is a product of Twentieth Century genetic engineering, a tyrant who ruled over millions before the disastrous Eugenics War of the 1990s forced him and his fellow genetic engineered followers into space aboard the Botany Bay in suspended animation. 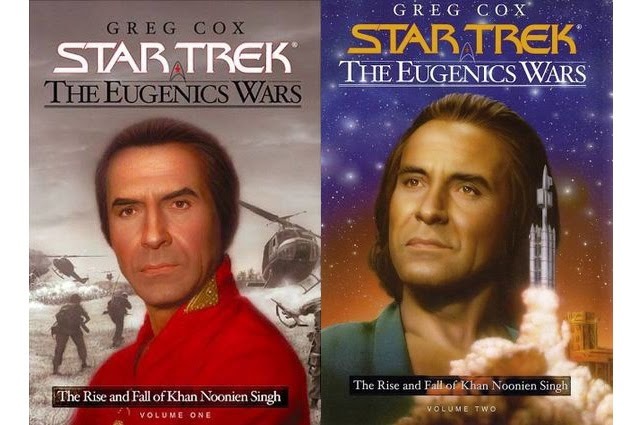 If you’re saying “But none of that happened,” or “Well Khan was created back in the 1960s when the 1990s were still a long way off,” then the two volumes of The Eugenics Wars by Greg Cox are for you. Published back in 2001 and 2002, the two volumes are a fascinating mix of what Trek continuity says "happened" and real world history of the late twentieth century. Unlike the more recent IDW comic/graphic novel which rewrote large chunks of the last forty years for its purposes, Cox instead chose to take a different approach to solving an interesting problem of Khan's background: That the 1990s came and went without a huge war between genetic supermen taking place. Cox portrays the Eugenics Wars not as a full-fledged world war but as a shadowy conflict often hidden behind real world events. As a result of the setting, the books focus more on the characters of the mysterious intergalactic secret agent Gary Seven and his human sidekick Roberta Lincoln (from the original series episode Assignment: Earth) as well as Khan, making them into perhaps more of a spy/techno thriller than a Trek story. Fans shouldn’t fret as Kirk and company appear here and there through the sometimes forced framing device of the Enterprise going to a rogue colony of genetically engineered humans who are seeking admittance into the Federation. Given that it’s two volumes long, the books cover a lot of ground. The first volume is primarily set in 1974 and sees Seven and Lincoln investigating the mysterious Chrysalis Project where Khan and his fellow “superior beings” were born, and it's here that the book is most like a spy thriller than a Trek story as the two travel around the world, eventually arriving at a base in India where the project is taking place. Once that sizable chunk ends, the book covers up to 1989 as the Cold War comes to an end and Khan, initially teamed up with Seven and Lincoln, grows up to discover who he really is and sets the stage for the Eugenics Wars proper. 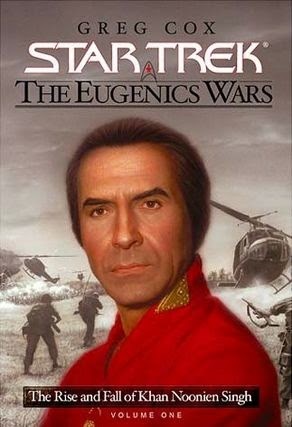 The second book takes us into the Eugenics Wars proper, covering the period from 1992 to 1996. 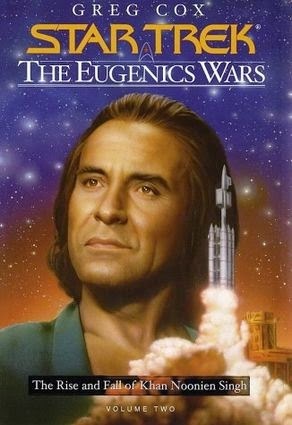 Given that the 1990s were quite a way off when Khan was introduced in “Space Seed” back in 1967 and that with them now having gone by without a huge war between genetic supermen taking place, Cox portrays the Eugenics Wars not as a full-fledged world war but as a shadowy conflict often hidden behind real world events (indeed both books feature appendix's explaining the real world events they tie into, from nuclear weapon tests to the hole in the Ozone Layer). It's in this book as well that Khan, now grown up, comes to the foreground as we watch him exerting the authority and quite menace that Ricardo Montalban brought to the character. And, as expected, the book ends with Khan and 72 of his followers launching into space aboard the Botany Bay which Cox takes the time to explain in light of how space exploration progressed in the real world. The results, across both books, makes for fascinating reading if you're a fan of the spy/thriller genre, as well as for any Trek fan. There’s plenty of Trek stuff in the books too. As well as the framing device, Cox fits in all kinds of references to most of time travel or twentieth century based stories from across all of the various Trek shows and movies (with the exception of Enterprise which had only started airing when the books were written and published). They range from a cameo appearance by the marine biologist Gillian Taylor from Star Trek IV, to the Trek universe’s own versions of Roswell and Area 51, with numerous other characters and events referenced along the way. For those worried about getting lost, most of the references are throwaway or explained in context so that those with even the most rudimentary knowledge of Trek can enjoy the books. Ultimately, these two books are more than your average Trek story. The results make for a good mixture of spy thriller, Trek continuity and real world events that believably portrays how Khan and the Eugenics War could have been part of the real-world 1990s. For Trek fans, and those interested in Khan’s back-story, these books are highly recommended.